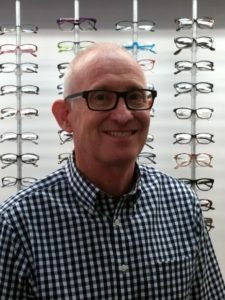 David is a highly experienced optometrist having been in private practice since 1983. He has a special interest in early detection of eye disease and advanced diagnostic technology. He also has extensive interest in most aspects of optometry. His consultation style is based on thoroughness, accuracy and problem solving. He will take the time to finely tune your spectacle or contact lens prescription to help you achieve your best possible visual performance. He will also take the time to go through the many possible lens types and help you find the most suitable option for your individual lifestyle. David will also utilise his knowledge, experience and the latest technology to screen for and investigate serious eye disease such as macula degeneration, glaucoma and diabetic retinopathy as well as less serious but annoying conditions such as red eye, dry eye and allergies. Should a condition be diagnosed that needs specialist treatment, David has excellent relations with many ophthalmologists and he can refer you to the most appropriate specialist for your particular condition. David is experienced with all age groups and is especially patient and understanding when consulting with children and the elderly.